21,139 German soldiers are buried in the cemetery. 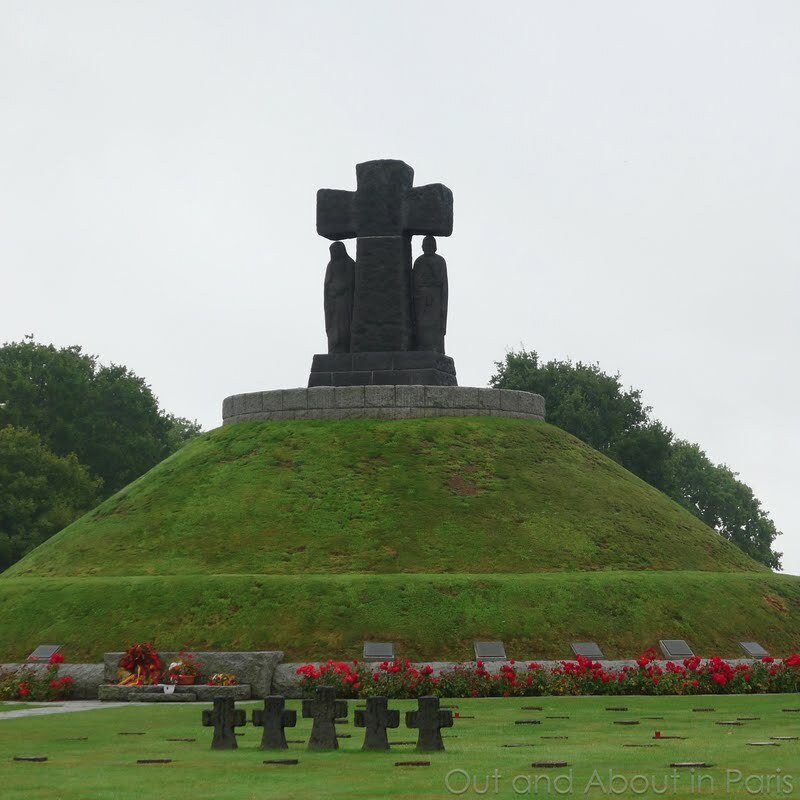 The sky was grey and a soft rain was falling when we visited the German cemetery in La Cambe. Perhaps that's why I had such a dark heavy feeling there. But why is it that I'm having such a difficult time writing about the German cemetery when the words about the American cemetery came so easily, almost without thought. Maybe it's because my heart was sad when I looked down at the grave of Gren. Otto Löffler, who was only 18 years old when he died on July 4, 1944, but my head will never forget the images of the Jewish people who died in the concentration camps. Was Otto responsible for the atrocious acts of Nazi Germany? I think not. He was probably just another scared boy who was told that he had to do his duty as a man and fight in a war that he wished would end. The war graves of all nations must be preserved - as a reminder to keep peace, as a call to communication and reconciliation for all people. As we were leaving the cemetery, our guide Bertrand asked if I was of German descent. When I answered that my mother's ancestors were a mixture of Germans and Austrians with a hint of Polish blood thrown in for good measure, he said that we could look in the large book with the list of those buried in the cemetery to see if there were any familiar names. Almost as if I was trying to deny my own heritage, my mind drew a blank and my Schleifer and Graf great-grandparents, both of whom were born in Germany, were resolutely consigned to the far corners of my mind. Even though I was able to visit the cemetery, I didn't want to be related to anyone who is buried there. Perhaps because then I would have to ponder the question - would my ancestors have had the courage to oppose the Nazis if they hadn't immigrated to the United States. The two American, seventeen British, two Canadian, six German, and the Polish cemeteries in Normandy contain the remains of over 100,000 war dead. The French are buried in the British cemeteries or in joint cemeteries. 18,000 civilians were killed during the Allied bombings of Normandy. as a call to communication and reconciliation for all the people." This is beyond marvellous. I have never seen a German war cemetery, and your beautifully-wriiten piece reminds us that 21,139 sons, brothers and fathers lie there, all grieved for by their families. I think the fact that it was grey and damp only adds to the sombre atmosphere you capture so very well. I was really interested that hardly any people go there, because in its way it is every bit as fascinating and poignant as the NAC, or any other less celebrated cemetery. Your piece is really important for bringing this up. I understand your thoughts as you looked down on that grave, as I have identical emotions when I visit some parts Germany, which is such a beautiful country, and where I have several great friends, and where the people have always been so kind and helpful to me. Yet it is inextricably bound to its recent past and will be so for at least a further couple of generations. Overall I think we have 'moved on', but it's important never to forget and your piece is an important contribution to both processes. The German word "Vergangenheitsbewältigung" is appropriate at this moment. And I'm so glad to be back. Tony, I can't tell you how much I appreciate your comment! This was probably the most difficult post that I've written because I didn't know where to start. In the end, it turns out that writing it somehow helped me process the complex blend of emotions that I was feeling while at the German Cemetery. When our guide asked, with a bit of a tentative tone, if we wanted to visit the German Cemetery, it never occurred to me to say no. I guess that some of his visitors don't want to visit it at all and other Americans specifically want to visit it because of their German heritage. On the other hand, he told me that he has never given a tour of the beaches, etc. to any Germans. I think that you're right in saying that the history is still too recent for us. If you have the opportunity, I would really recommend going to the German Cemetery the next time that you're in Normandy. Welcome back, Joseph! 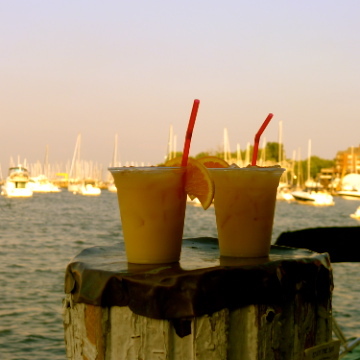 I've missed you but am very glad that you had a good trip to The Hamptons (oops, East End). Even though I lived in Germany I had to look up the meaning of your German word. "Dealing with the past". It's true -- very appropriate. We visited a different German Cemetery, this one had a little over 11,000 soldiers. It was sad because we were the only ones there. We tried to check for relatives, and may have found some, but different spelling of names left questions. I think one thing to remember is there was the German soldier that just did their duty. Then there is the SS Troopers that did not have any feelings in what they did. Do not generalise by saying "the SS troopers did not have any feelings in what they did." They too were young men defending their country and were victims thrown into the war. Read up on the SS troopers before you judge them. Most of them acted honourably and treated the French correctly. They also treated their US/British/Canadian POWs correctly. While many of the American, British and Canadian troops committed atrocities and war crimes against the Germans. About a decade ago I returned to Normandy to show my husband a few of the places which had been so memorable for my teenage son and I during my first visit. Because this time we were on our own and not tied to a tour when we saw the German Cemetery sign on impulse we could stop, something we'd never planned, nor even thought of. I will never forget that German Cemetery visit, and how poignantly divergent its experience felt from that of the American Cemetery. It is also stunningly beautiful, but its esthetics speak just grief and loss. There is nothing triumphant here.. its heroes are all tragic. As other posts have written, we were the lone visitors that day which amplified the silence and sadness, and reminded us of the loneliness of death for so many, so very young boys, also away their homes, families, and those who knew them longest and loved them best. 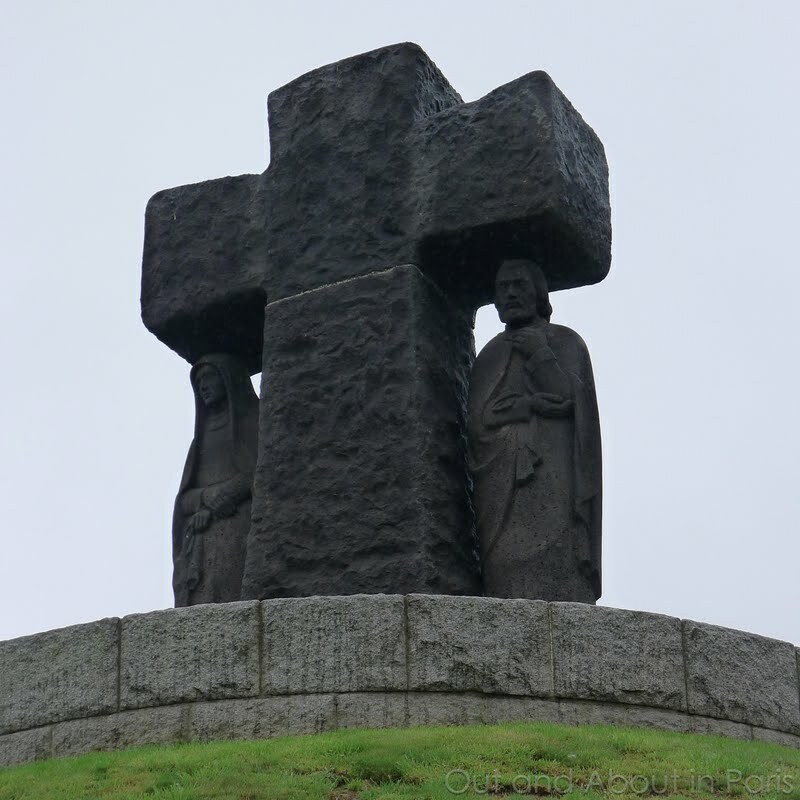 Because I felt neither the awe, nor the pride, nor the gratitude I felt as an American at the American Cemetery, the German Cemetery at La Cambe may be the truer example of Albert Schweitzer's "soldiers gaves are the greatest preachers of peace." Lastly, because the names on the crosses (dark, rough, heavy, stone, IMBEDDED in the earth, not white, smooth, and pointed upright as at the American cemetery), included BOTH the birth dates and the death dates, it was all too clear how young these soldiers were.. many, if not most, were younger than our own two, much loved and irreplaceable boys. Again thank you for your photos and comments.